100 posts: A look back with 7 Links. Looks like this is my 100th post. I can’t believe that I have posted so many inane ramblings about my life in Japan, but it is true. Andrew from Unframed World nominated me to participate in the 7 links craze in the travel blogging world, and although this is less of a travel blog than a ‘stuff I did yesterday while living in Japan blog’, in celebration of 100 posts, I will. I’m going to have to go with this post about eating sushi in Shimonoseki. So much beautiful fish. This post, which consists of a video of Daniel Radcliffe arriving at a girls school in Japan received four comments – two from me, which officially makes it my most commented. I’m not savvy enough to use any other method to decide my most popular post, so this will have to do. Fortunately my blog lacks controversy almost entirely. I suppose I have to choose this post, in which I talked about the delight that is fried mashed potato croquettes, and my friend said they looked like Chicken Nuggets. Forget most, this is my only helpful post. I included some simple Japanese phrases at the bottom of this post, and it may be the only post where any real knowledge can be gained by reading my blog. This post about the joy of Kaiten Sushi marks the first time someone I don’t know in real life commented on my blog, which certainly surprised me! Any attention at all is more than I usually expect, but this particular post is one of my favourites, so I’ll throw it in here. It chronicles our misadventures on the great wall, including some pretty sweet light photos. I am most proud of this post, about cycling the Shimanami Kaido, not because the post was particularly good, but the accomplishment of finishing the route without wimping out and taking a bus. Well that’s that! 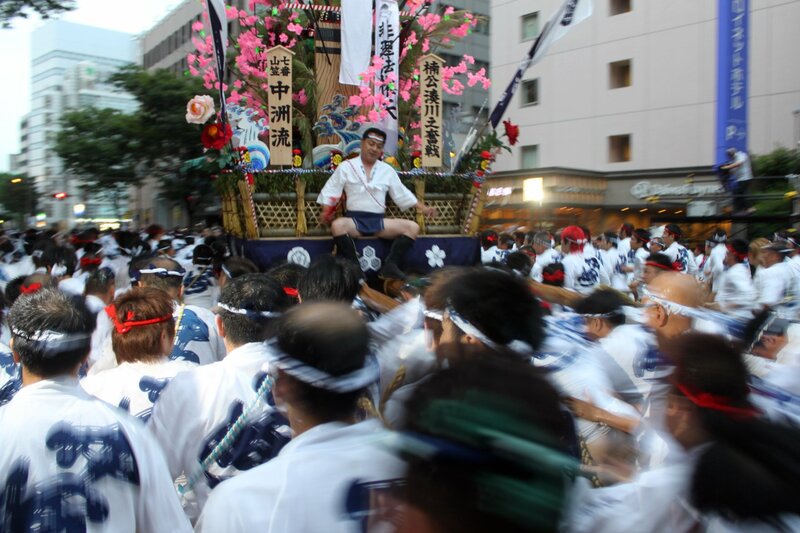 I realized this is a post devoid of pictures, and no one likes blog posts without pictures, so here’s a gratuitous photo of a float from last weeks Yamakasa festival.